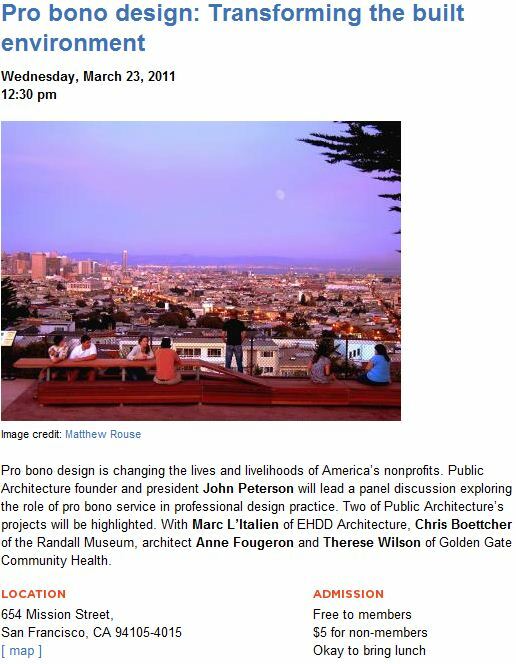 The San Francisco Planning +Urban Research Association (SPUR) is hosting a panel discussion "exploring the role of pro bono service in professional design practice." See below for event information on the SPUR event page or if you can't attend... read more about this subject in the recently published "Power of Pro Bono." One of the projects highlighted (pictured in the event page above) is that of our very own Matt Rouse. February 13th, 2011 at 10:53 AM. Posted in . Share this post.